I highly recommend spending a morning with Tim Gunn talking about beauty and style trends. To celebrate the new Olay Regenerist Luminous products, Olay invited a few of the top beauty bloggers in NYC to gather at the newly renovated Walgreen&apos;s in Union Square to tour the store, test new products, meet with a top scientist and enjoy a little girl time. We started the day heading through the second floor beauty section. I guess I never considered the breadth of products Olay carries. IT TAKES UP AN ENTIRE AISLE! From tweens to octogenarians and everyone in between, there&apos;s an Olay product specially formulated to solve skin problems that bother us. 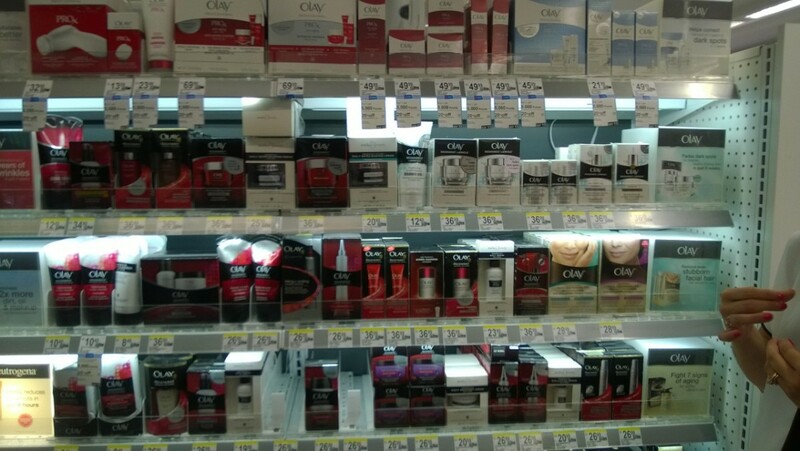 As we toured the store and admired the variety, Tim pointed out a few of his favorites and Olay scientist Shannon Weitz talked about some of the new and exciting Olay products available at Walgreens. After the store tour, the bloggers headed back to a private area to talk with Tim and Shannon, and learn more about the new Olay Regenerist Luminous products. Shannon has spent 14 years in the P&G research and development department. She is a biochemist who specializes in skin biology and is part of the team that comes up with key new ingredients. Let me say this she has gorgeous skin! The lucky mom/scientist spends a lot of time testing before any product make their way to consumers. "My job is to link science back to what consumer wants," said Shannon. Studies show that Olay Regenerist Luminous lotions fades dark spots in 8 weeks, when you use the oil, results appear in 4. How does this magic happen? The key is with the Olay oil the product penetrates 10 layers of skin. We learned that it&apos;s all about using the right oils. Olay chosoe oils that are similar to the oil our bodies produce, natural oils like tangerine are lighter and absorb quickly, saturating your skin with vitamins and antioxidants. Shannon told us that facial oil is one of the more amazing developments in skin care. "Your skin made of oil and water. The right balance is key," said Shannon. Olay Regenerist Luminous will help rebalance skin. All the bloggers loved the scent and feel of the formula. We were fascinated with the concept of adding oil into our skincare routines. I mean oil. Isn&apos;t that what we all feared in high school? Well, the news is that we need oil. It&apos;s all about finding the right balance. Why oils? Did you know when using the right amount – just a few drops – natural oils absorb instantly, giving your skin a sheer glow rather than a shine? As we age, our natural oil production decreases, making wrinkles appear deeper and more defined. Naturally derived oils like tangerine absorb quickly, preventing water loss and softening the appearance of fine lines. At night you can add a spot treatment for areas that need more balance. Olay Regenerist Luminous will even the whole canvas of your face. I am one of those women with a lot of melanin in my skin. I&apos;m of Portuguese descent and have very olive skin. Though I am not prone to wrinkles, I do get blotches and uneveness in color. Olay Regenerist Luminous is the perfect treatment for my skincare concerns as a 40-something woman. 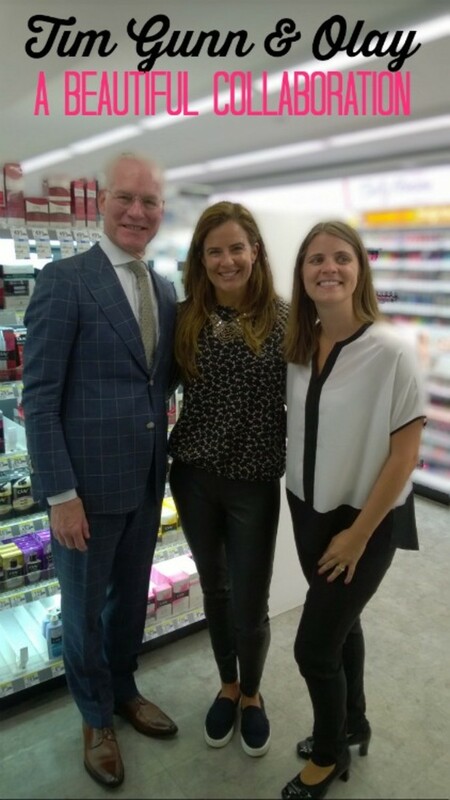 We loved chatting with Tim Gunn about his skincare routine. Since 2004, Tim has starred as adviser and co-host of the Emmy-winning fashion reality show, Project Runway. He has to stand next to Heidi Klum all the time and get this...Did you know he wears NO MAKEUP on TV! What you see is what you get. So he makes an effort with his skin. Tim said skincare is key for men and women, "If you have a fabulous outfit and no grooming it doesn&apos;t work." So true Tim. Shop next week and save! 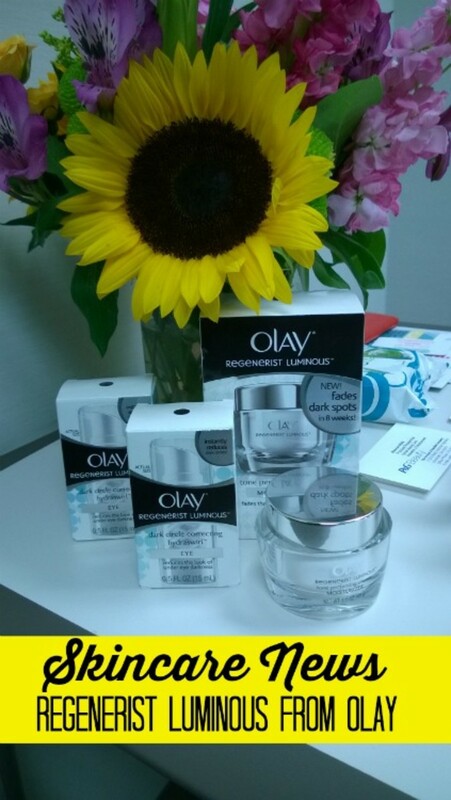 Don&apos;t miss out on this special offer: Olay Regenerist Luminous will be sale for $23.99 during the week of 9/28-10/4. There will also be a $3 brandSAVER coupon in the P&G brandSAVER insert in newspapers nationwide on Sunday, September 28. That means when you use the coupon in combination with the sale price, you can get these fabulous Olay Luminous products for $20.99 each! This is a sponsored post. All opinions are my own as are all photographs. Contest is open to US residents 18 and over. Contest ends 10/1/14 at midnight ET. For more contest details check our rafflecopter link.